The Metal Gear video game franchise has a reputation for excellence in storytelling and innovative gameplay. It is also comically difficult. Join Deadshirt Editor-in-Chief and absolutely terrible video gamer Dylan Roth as he plays through the entire Metal Gear canon in celebration of the long-awaited Metal Gear Solid V: The Phantom Pain, released earlier this month. Peace Walker represents a turning point of sorts for the Metal Gear Solid series, veering away from tightly-knit linear storytelling towards more contemporary player-selected missions. It’s not quite open world, as the main Snake campaign does progress only in a particular order, but for the first time there are optional bonus missions, and the ability to replay stages and earn higher ratings. It integrates online play into the story and gives the player responsibilities beyond just sneaking and shooting. Peace Walker is a tale of the soldier Snake growing into the leader Big Boss, and that transition is reflected in the new, broader scope of tasks for the player. It’s not quite an RPG or a strategy game, but it’s no longer just a sneak-and-shooter. Hi, I’d like a large order of foreshadowing, please. Peace Walker isn’t the first PSP game in the Metal Gear series; it’s preceded by the non-canon card-based combat Metal Gear Acid games, and by the semi-canonical Metal Gear Solid: Portable Ops, which introduced some of the gameplay elements found in Peace Walker. But while Portable Ops has fallen out of print—and out of favor with Metal Gear creator Hideo Kojima—Peace Walker remains an essential chapter in the saga of Big Boss, and has been ported and upscaled to HD on the PS3 and XBox 360. It’s available in the Metal Gear Solid Legacy Collection for both of those consoles, on the same disc as Sons of Liberty and Snake Eater, and leads directly into Metal Gear Solid V: Ground Zeroes, the prequel chapter to The Phantom Pain. Peace Walker is the real deal, and it’s built to last. Like its predecessor Snake Eater, Peace Walker is a compelling tale of Cold War intrigue, anchored by the emotionally wounded soldier Snake, a.k.a. Big Boss (voice of David Hayter). 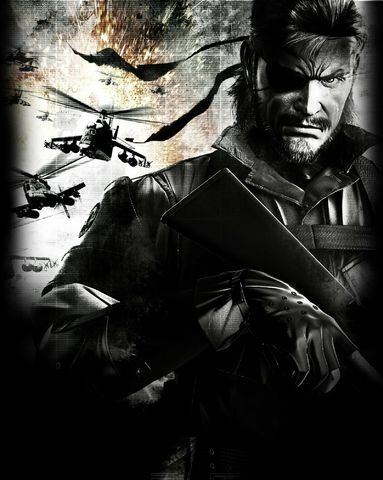 In the decade since being forced to hunt down and kill his beloved mentor, The Boss, Snake and new companion Kazuhira Miller (Robin Atkin Downes) have launched a private military company called Militaires Sans Frontières (Soldiers Without Borders), or MSF. Lured in by an apparently recent audio recording of The Boss’s voice, Snake agrees to lead MSF on a mission to investigate and repel an unwelcome CIA operation from peaceful Costa Rica. 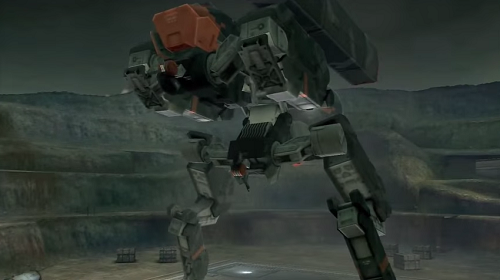 What Metal Gear game would be complete without some giant robots to fight? 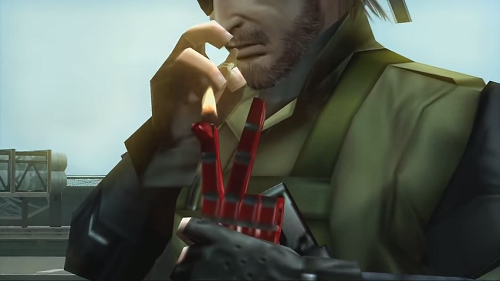 The existence of this apocalyptic weapon is disturbing enough, but Snake is horrified to discover that Peace Walker’s AI is a reconstruction of his late mentor The Boss, and that ending the threat of Peace Walker will essentially require him to kill her all over again. Along the way, Snake teams up with Nicaraguan revolutionaries, battles giant robots, and comes to terms with his role in The Boss’s death. Meanwhile, at their secret Mother Base in the Caribbean, Snake and Miller build their stateless army into a state in and of itself: Outer Heaven. Back in my review of Snake Eater, I praised its relatively straight-forward plot as a welcome palette cleanser after the mind-bending Sons of Liberty. This goes double for Peace Walker, which is the first new installment following the epic and labyrinthine campaign of Guns of the Patriots. As much as previous MGS games are hailed as being “cinematic,” Peace Walker (despite its story being told mostly in motion comic cutscenes by Ashley Wood) would likely translate most easily to film out of the entire series so far. Ironically, it may be the very technical restrictions that limit the use of cinematics that make this game good cinema—the story is relatively short, with a fairly small cast of characters, and long expository monologues are kept at a minimum. The comics still have voice acting, and they’re a lot more visually interesting than the long codec calls in earlier games. I’m continually impressed by how well Kojima and company have gotten me invested in the character of Snake/Big Boss, who I (like many players) was initially introduced to as a villain. Peace Walker is clearly a stepping stone on his path to becoming the warlord Solid Snake faces in the first two Metal Gear games, but following the story from Big Boss’s point of view, he’s yet to come across as mad or vicious. Quite the contrary—he seems to want a peaceful, united world as much as the next person, his experience has just led him to take a troubling, inevitably doomed approach to Utopia. He’s an anarchist, and that philosophy rarely takes individuals or groups to a peaceful or prosperous place, particularly when their existence is seen as a threat by the established order. He’s driven by bruised feelings and lost purpose, looking to change the world using his one and only aptitude: violence. As with every installment in the Metal Gear Solid series, the game’s gender politics are pretty screwy, with every cool, interesting female character offset by something offputting or outright gross. For example, Paz Ortega is introduced as an angel of peace, practically defined by her youth and innocence. So, naturally, this is the character whom the player—in a series first—gets to court and eventually bang inside a cardboard box. I suppose this has to be someone‘s sexual fantasy. That she is, at best, twenty-two years old (or at least claims to be; the revelation that she’s a double triple agent muddies up the backstory a bit) and Snake is explicitly a year shy of forty, and that the dating sim element is introduced rather suddenly after hours of treating Paz more like a child than an adult, makes the whole thing pretty creepy. Badass scientist Strangelove is a pretty cool new character, though her homosexuality is thrown out the window at the last minute so that she can hook up with “Huey” Emmerich. The series’ saving grace in this respect continues to be The Boss, who even in death remains the most interesting character in the franchise. The game ends with a hook teasing the challenges ahead in Metal Gear Solid V, forecasting the confrontation between Big Boss and his former commander, Zero, who was introduced in Guns of the Patriots. But while longtime players had to wait four years to see how it plays out, I get to jump right to it…after a brief detour. More on that in a bit. Since Peace Walker was originally developed and released for the PSP, much of what separates it from previous games may have been dictated by hardware restrictions. However, nearly every technical disadvantage is turned into an advantage in some way. Missions are shorter, but there are also many, many more of them than previous titles. 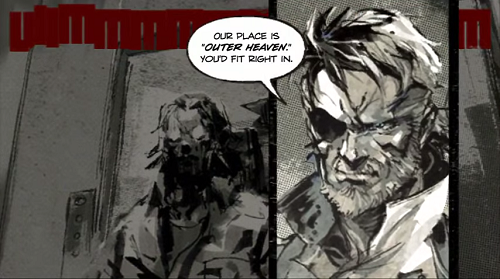 Rendered cutscenes are almost all replaced by motion comics, but the comics often include quicktime events, allowing for more interactivity than is possible in your typical Metal Gear Solid mini-movie. In terms of staple gameplay elements, nothing absolutely essential is removed, and a tremendous amount is added. The ability to crawl on your belly and hide underneath cars and other raised platforms is gone, but rarely missed. On demand codec dialogues are replaced with short snippets from relevant support staff during action, and a library of “cassette tapes” full of exposition and texture that you can browse between missions. This is, arguably, an improvement, as it allows players to learn more about the characters and locations in detail without pausing in the middle of a task. 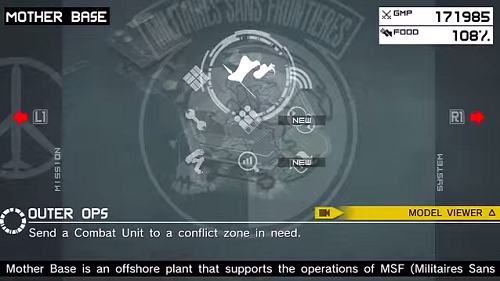 Mother Base introduces some strategy elements to the Metal Gear series. While the ability to build and command a small team was introduced in Portable Ops, Peace Walker is the first game in the series in which you’re tasked with building up an army, staffing your base, and managing your resources. While there are twenty-plus hours of story and bonus missions to play yourself, you’re also able to send squads out into the field to complete missions, earn money for MSF, and refine their skills. At first, your teams are made up of soldiers you’ve captured during the story, but eventually MSF’s reputation grows, attracting high-caliber volunteer soldiers, whom you must best in short hand-to-hand fights to earn their respect and loyalty. 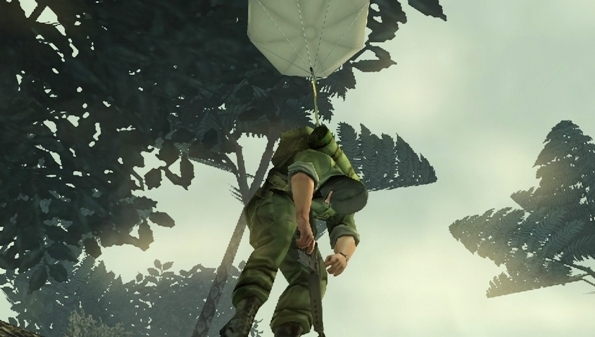 Which brings us to one of the most welcome/insane additions to the series: the Fulton Recovery System, in which you tie balloons to unconscious enemy troops so they can be yanked away by overhead aircraft. It’s super useful—allowing you to conscript soldiers into your army while simultaneously making sure your victims aren’t discovered, which would blow your cover—but it’s also a bonkers, hilarious concept that’s just incredibly fun. It is also a real thing. There’s something marvelous about strapping a balloon to an enemy and putting him to work in your mess hall. 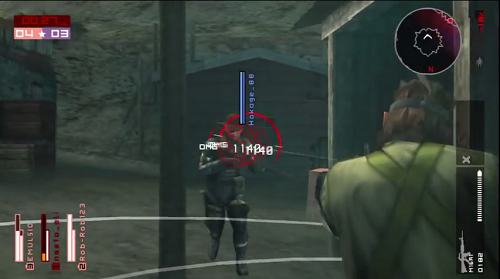 Peace Walker also boasts a wider variety of missions and play modes than any previous MGS title. Snake’s story missions are nothing unfamiliar to long-time players, usually consisting of sneaking past or subduing enemies to reach a goal, acquiring intel from other characters, and fighting cool robot bosses. However, there’s also a wealth of Extra Ops, most of which you can play through as Snake or as one of the MSF soldiers in your combat unit. (They’re all masked and anonymous, but you can play as either a male or female soldier, which is a nice addition.) You’re also able to play most missions with a group of up to three friends online, which can often make difficult boss battles go a lot more smoothly. Unlike many other combat games that offer online play, Peace Walker doesn’t separate Co-Ops or Versus Ops from the standard single player campaign. Quite the contrary—players are expected to incorporate online missions into their regular gameplay diet. Versus Ops appears on the Mother Base menu right along with your standard mission select, R&D, and staff management. Your ability to attract quality volunteers to MSF depends on how often you play online (though, thankfully, not on how often you win). You can request online assistance on almost any story mission, or team up to help another player, all without leaving your campaign. The ability to alternate easily between single player and online missions, and the way they complement each other and help you build up your stats, improves both sides of the game and expands an already lengthy gameplay experience indefinitely. It’s no surprise that even now, after the release of The Phantom Pain, you can still find players online to fight or team up with on the PS3 version of Peace Walker. Hot Snake on Snake action. Peace Walker‘s breadth and depth of play kept me engaged and addicted—if I didn’t have this column to write and more games to complete, I’d likely still be playing it, through 100% completion and then some. But I’ve got bigger fish to fry. MGSV awaits, but I’ve got one last mission before I can get to the home stretch: the fast-paced action insanity of Metal Gear Rising: Revengeance! SNAAAAAAAKE! will return next week to review the polarizing spin-off title in all its hack-and-slash cyborg ninja glory. CategoriesSNAAAAAAAKE, Video GamesTagsDeadshirt is Playing, Metal Gear, Metal Gear Solid, Metal Gear Solid: Peace Walker, SNAAAAAAAKE!